Training, the key to development, engagement, retention, and productivity and compliance. Developing employees’ abilities and knowledge on everything from compliance and job-related skills to leadership and communication is critical. But how valuable is training? We recently found out! We conducted a recent survey on training ROI. In this webinar, we will cover the results of the survey, plus expert commentary on the topic. Are you in the marketing for a corporate LMS for internal eLearning? Here at the 5 things you need to look for! The ability of an LMS to integrate with other software can multiply its power and utility. But not all integrations are made equal. In this article, we examine the 5 LMS integration options you should demand from your training platform. One of the best ways to stay on the cutting edge of Learning and Development is to take a look at recent technologies and trends. In this article, I’ll highlight 10 hot Learning and Development trends for 2018 that you may want to incorporate into your online training strategy. As the younger workforce grows, leading Μillennials will require a shift from a style of top-down management to collaborative inspiration. Talent and development leaders who are working with the emerging millennial workforce should keep in mind what engages them and use that to lead them. Here is why social learning is a smart move for your organization and why these 7 social features are absolutely essential for all learning platforms. A variety of training programs can be delivered through mobile learning. In this article, we’ll explore the different types of training programs where mLearning can be used. It seems obvious that the biggest advantages in introducing an AI-powered VA into your organization would be a reduction in costs and an increase in effectiveness. The AI VA has the potential to perform tasks more quickly and efficiently saving time and money. But there’s more to it than that. Online training doesn’t end after the onboarding process. Take a look at these benefits of ongoing online training, and find out how it can impact your organization. Are you making it super-easy for your prospects to see your product without getting locked into a one-on-one sales pitch? In this article, I’ll discuss the benefits of offering product demos for large groups and tips on how to get the most out of them. A manual Moodle LMS installation is the recommended method for small to medium Moodle implementations; or in other words, those organizations who plan to use Moodle for small projects. Here is how to install Moodle on Windows and Mac. What is worth learning? Spring this question in your next meeting and watch the sparks fly! There are several traps (opportunities?) hidden inside this question. We’ll unpack some of them here, so you can use them as opportunities instead of watching them hijack your next meeting or project. Learn about Subject Matter Experts and other roles in an eLearning project. See what’s your true role as a content developer and how to manage expectations. Starting a coaching business is a big undertaking, to say the least. The following article will outline 4 areas that will not only help you build a solid coaching business but are also sustainable techniques. Where production is about creating the ARG’s content, components, and technologies, post-production is where those elements are given life. Allen Communication Learning Services creates custom Web-based and blended e-learning solutions for a select corporate clientele. We are currently looking for an experienced Learning and Development Consultant to lead the design and development of learning solutions for our clients. LEO Learning features on Training Industry’s 2018 Watch List of Top 20 Training Outsourcing Companies. AllenComm presents innovative onboarding, sales enablement, brand training, and compliance training at booth #2514. 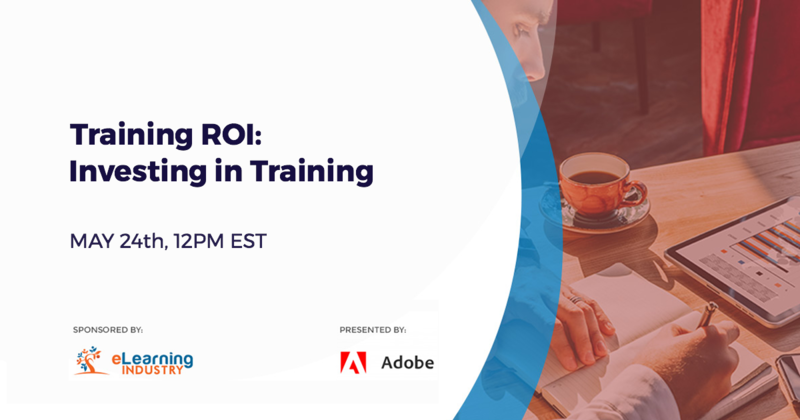 Join us for Training ROI: Investing in Training, a free webinar presented by Adobe’s Principal eLearning Evangelist Dr. Allen Partridge and sponsored by eLearning Industry. Find the answers to your questions about training effectiveness and measurement, together with findings of Adobe’s recent survey on training ROI. The event is scheduled for the 24th of May 2018. Join us for Making A Success Of Your Learning Technology Implementation, a free webinar sponsored by eLearning Industry with Donald H Taylor, author of ‘Learning Technologies in the Workplace’. The event is scheduled for the 31st of May 2018. Success in business requires skill. It requires strategy. Most of all, it requires you to prove yourself—to demonstrate that you deserve the opportunity to lead. Getting an online MBA, for many executives, is an important step in their success stories. It’s the one thing in their career that makes the biggest difference in their future. Website design and development isn’t all pretty shading and fancy fonts. Less obvious factors can totally crush your ability to do business online. The eLearning Business Case for a Learning and Development or Training Team often stems from a specific need, and the key to success is to engage with all interested parties as early as possible. This ensures you support what needs to be achieved in the short term, whilst still considering the long-term goals, without adding huge costs. In this video, I will show you how to create a GIFT format file to import your quiz questions with great ease and reduced time. In addition, tune in until the end of the video to learn about a tool that can help you out. The button you are seeing at the bottom of your text container (smart shape or text caption) is by design in Adobe Captivate 2017. It appears when a text container contains more text than can be accommodated by your minimum font size and the size of the text container. For example, when displaying large paragraphs of text on a smartphone display.